** The following article is copied from www.thegospelcoalition.com. Throughout our parenting efforts, character consistently must be made the key priority in everything we do and say. In theory, this point may seem obvious, and few would likely disagree. In practice, however, many of us don’t actually parent in such a way that character is the overriding focus in the way we relate to and guide our children. So, let’s briefly define character and then look at ways we can help our children develop character through the various life stages of parenting. Character is who a person is at the core of their being. It affects all their relationships and accomplishments in life. And character doesn’t just appear in our children; we must be diligent to make it a focus, cultivating it in their lives, especially when they’re young. While many parents prize activities or achievements (sports, education, or good grades, to name just a few), character should be the priority and be valued as that which undergirds every aspect of life. In conjunction with establishing children in their personal faith in Jesus Christ, parents’ central concern should be on their child’s character development—as a response to what Jesus has done for them. At the core, we want to encourage our children to be more like Christ (Rom. 8:28–29). As a child encounters various challenges and opportunities, his or her character is molded. The tendency for many young—and not so young—parents is to indulge their children, especially their first child and often also the youngest. However, if we pamper our children and permit them to get their way all—or even most of—the time, we’ll reap the consequences in the form of a spoiled, ungrateful child bent on getting his or her way. We’ll be training the heart of a manipulator who subtly but effectively subverts the role of the parent. This runs counter to the parental responsibility to foster traits of submission and cooperation within the family. The stewardship of developing character in our children is vital, not only for ourselves and our children, but also for the sake of family unity and dynamics, for the community of believers, and ultimately for the mission of God. It’s absolutely essential to stand firm as parents and make sure we’re parenting our childrenrather than the other way around. Your primary goal in parenting is not to minimize conflict but to build genuine character. Toward that end, it’ll be important to communicate from the beginning that you, not your child, is in charge. This isn’t a matter of trying to stifle our children’s development and self-expression or acting as overbearing despots shutting down all their initiatives. Rather, it’s a sign of true, committed love and of being responsible as a parent. As the book of Proverbs continually affirms, discipline is vital in childrearing, and the loving parent provides consistent correction and accountability (e.g., Prov. 6:23; 12:1; 14:24; 29:15). 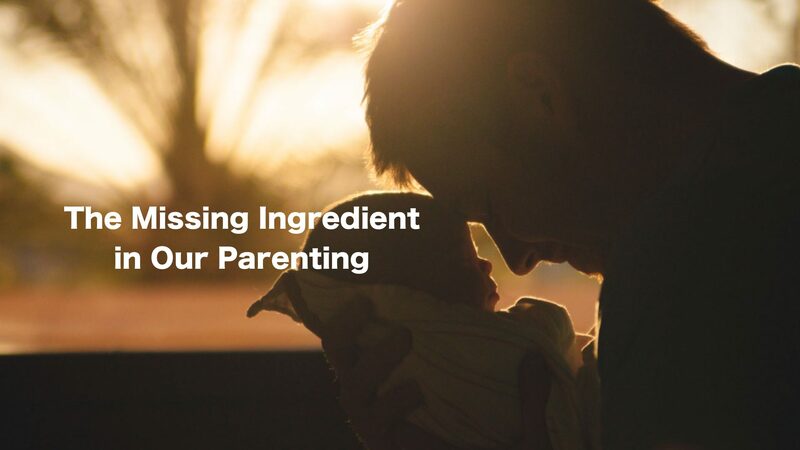 As you move through the life cycle of parenting—from infancy to childhood to adolescence to early adulthood—the nature of your relationship with your child will inevitably change, but your commitment to building character should remain constant. This is what “responsible parenting” is all about. In the short run, a laissez-faire, hands-off approach may seem preferable in that there may be less conflict, but it will not likely result in a young person marked by character and maturity. Remember—your primary goal in parenting is not to minimize conflict but to build genuine character. So, as your child starts school, what is your main goal for them? Is it to see your son or daughter get good grades—straight A’s? Good grades certainly have some value and may be an indication of intelligence and academic ability—or at least of being able to do well within a given system of expectations—but they’re not always a reliable indicator of character (though they can be). If not grades, is your focus as parents to promote your child’s athletic success? Being a good sports parent may be one of the signs of a “good” parent in this generation, but are you pushing your children too hard to excel in baseball or basketball or some other sport? You may be the perfect soccer parent, present at every game, capturing memorable moments on camera and posting them on social media—only if your child’s team won the game, of course—perhaps even the coach of your son’s or daughter’s team. You may sacrifice much of your time, especially on weekends, to invest in your child’s recreational pursuits. Yet your child’s heart may remain unregenerate, his mind set on winning at all cost, and his sense of identity staked on how well he did on the baseball or football field. In the end, who is going to watch all those videos? What does it really matter if your son’s team won or lost a given game? But his character will have been affected, for better or for worse, and it’ll be too late for you to turn back the clock. Rather than focusing on good grades or athletic (or other) achievement, invest the bulk of your efforts on helping your child develop character. Since character is who a person truly is in their heart, exemplified in what they do when no one’s looking, good character means integrity—a stable core of conviction that isn’t easily shaken by peer pressure, cultural influences, or shifting circumstances. As you seek to shape your child’s character, which values will you seek to impart? And what will be your strategy to teach and reinforce those values? Character isn’t formed by default or by chance. What’s more, children tend to imitate their parents’ behavior, so we’ll want to make sure that we ourselves are people of integrity. So how do we accomplish this aim? First, we can recognize that, while requiring parental focus and commitment, developing character in our children can’t be done apart from the Holy Spirit’s work in your child’s life. If we take on the task ourselves, the burden of forming character will be overwhelming; we just can’t build character in our children through our own efforts. The Spirit will do his work in our children as they enter their own relationship with God and as they themselves strive to be men and women of integrity and moral excellence by God’s grace. Developing character in our children can’t be done apart from the Holy Spirit’s work in your child’s life. A catena of Scripture passages on the Spirit shows that the Spirit produces in all of us (including our children) what is pleasing to God. As they walk with him, are led by him, livein him, keep in step with him, and are filled with him, they’ll set their mind on spiritual things, and the Spirit of the risen Christ will infuse their mortal bodies with supernatural strength to surmount their sinful nature. Paul encourages believers to “walk by the Spirit” and be “led by the Spirit,” and writes that “the fruit of the Spirit is love, joy, peace, patience, kindness, goodness, faithfulness, gentleness, self-control” (Gal. 5:16, 18, 23). He adds, “If we live by the Spirit, let us also keep in step with the Spirit” (Gal. 5:24). He also urges believers to be “filled with the Spirit” (Eph. 5:18) and affirms that “those who live according to the Spirit set their minds on the things of the Spirit” (Rom. 8:5; cf. v. 11). In this way, our children will be able to please God and “do all things through him who strengthens” us (Phil. 4:13). Again, the apostle Paul strikes the balance beautifully when he urges believers, “Work out your own salvation with fear and trembling, for it is God who works in you, both to will and to work for his good pleasure” (Phil. 2:12–13). Encourage your children to strive actively to “work out their salvation,” trusting that God is at work in them, both to have the resolute will and the actual power to live the life God wants them to live. If you’ve introduced your child to Christ—and he or she has received him and become a child of God—you have the opportunity to nurture their spiritual lives by impressing on them Scripture about the work of the Spirit in keeping with the above-cited passages. The last thing you’ll want to do is condition your children to live the Christian life in their own strength! It’s character, parents! Focus your energies on developing character in your children. Don’t worry too much about good grades or athletic achievements. Those do have their place, but character trumps scholastic or athletic accomplishments in the end because Christlike character is a permanent, lasting fixture of our children’s lives, both in this present life and also in the life to come. Winning a tournament or playing at a recital, on the other hand, are temporal achievements—here today, gone tomorrow. It’s character, parents! Focus your energies on developing character in your children. Therefore, parents, care more about inculcating virtues such as integrity, honesty, and selflessness in your children than being unduly preoccupied with or blinded by external badges of honor. The virtues God celebrates are Christlikeness and the fruit of the Spirit—love, joy, peace, patience, kindness, goodness, faithfulness, gentleness, and self-control. If your child were to take his or her final exam in these characteristics, how would they do? Would they get an “A” or “F” in self-control, for example, or somewhere in between? What about the other virtues on the list? And how would you do? We know these are convicting questions. While ultimately character is the result of the work of God’s Spirit within us, Scripture nonetheless urges us to “make every effort” to actively pursue these virtues and even to excel in them (2 Pet. 1:3–11). So, parents, let’s get to work and strive to build Christlike character in our children by the grace of God and in the power of the Holy Spirit!